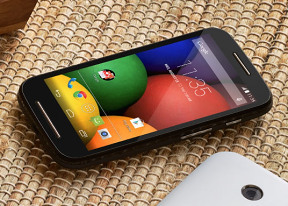 The Moto E comes with a modest 5MP fixed-focus camera. It takes images in a maximum resolution of 2592x1944 pixels. It lacks auto focus but it has a built-in HDR mode, which can even be set to activate automatically in certain shooting conditions. The camera does have the same minimalist interface as on the Moto X and G, which includes just two on screen buttons on the right-hand side for video recording and front-facing camera. Taking an image is done simply by tapping the screen. The available advanced settings include HDR, touch focus , panorama, geo-tagging, widescreen mode, and shutter sound. There isn't much to talk about the produced images. The resolved detail is low, the contrast seems a bit down too, while the colors and the white balance are OK at best. Macro shots are, of course, a no-go, as there is no auto-focus. Turning on HDR does a better job of extending the dynamic range, but the quality remains as poor as that of the standard shots. The Auto-HDR is a bit unreliable so we'd recommend manually choosing whichever mode you prefer so as to get more consistent results. The Moto E enters our Photo quality comparison tool to face off against other 5MP shooters. You can also pit it against other cameras from within the tools' page. The camcorder UI is the same as the camera one, with the top right button being used to toggle video recording. The Moto E records FWVGA (864 x 480) videos at a constant 30fps. The bitrate is a meager 8Mbps, which can partly explain the poor resolved detail. Audio is recorded at 128 Kbps in stereo mode with a sampling rate of 48 kHz. Videos on the Moto E are far from stellar, with the low level of detail being the most noticeable issue. There are similar problems with poor dynamic range like on the still camera, and the contrast is still on the low side. Here come two untouched WVGA video samples taken straight from the Motorola Moto E.